This tool has to configure server side and client side to complete a test. It can test from client side to server side , also can test from both direction. The main download site is from https://iperf.fr/iperf-download.php. 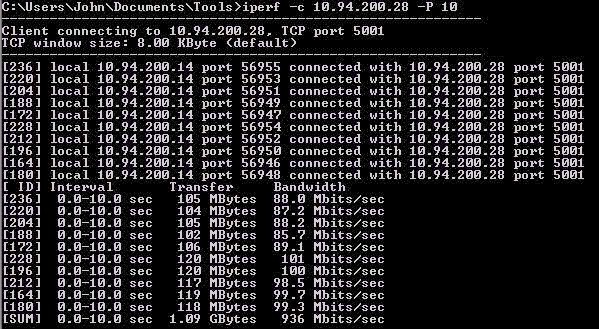 Running command ‘iperf -s’ from command line as iperf server (ip address 100.99.136.66). User ‘ipef -c’ command to run from client test machine (ip adss 100.94.200.14) to evaluate the network throughput based on TCP connection. To measure the bi-directional bandwidths simultaneousely, use the -d argument. If you want to test the bandwidths sequentially, use the -r argument (see previous test). By default (ie: without the -r or -d arguments), only the bandwidth from the client to the server is measured. c：start iperf as client, followed ip address is remote server ip. p：set specific server port, which should be same as server side’s settings. Other parameters can be found from https://iperf.fr/iperf-doc.php.